Photography and Life by dr Frank: Don't Quit! A few years ago I created the base for this image. 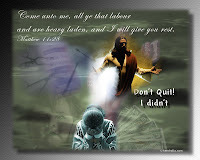 Recently, I added the image in front of the cross which represents the 'reward' [to us] of Christ not quitting. He conquered death and Hell when he rose from the grave! Even when times appear to be very challenging and it feels as if we are going to crack; keep in mind Christ did not quit. He provides us the strength we need to 'win' in life's challenges. Christ is the only hope to a world frustrated by poor decisions of business and government 'leaders'. Please take the time to study the image. Regardless of your 'challenges' in life, Christ is the only hope to a world frustrated and scared over the continued negative news that pours from Wall Street. I once heard a pastor state that in his dictionary the word 'kwit' did not exist. He cut it out! Proverbs 24:16 For a just man falleth seven times, and riseth up again: . . . It is Christ and Christ alone that will never leave you nor forsake you!